Have you ever given a thought that you can reduce your wrinkles, pimples, tanning and other skin problems with the help of some pretty good home remedies for skin care? Turmeric powder, besan, malai, milk, curd, tomatoes, cucumber, can do wonders for the ones who are plagued with pigmentation and other skin problems. In fact there are many side effects of using the skin care products available in the market. The fairness cream can further damage your skin. The most harmful chemical which is present in fairness creams is hydroquinone. All those powders, foundations, primers and concealers that slick smoothly into your skin, quietly hampers it. These products make use of sunscreen ingredients to control tanning. Hydroquinone bleaches our skin. Long term use of these products not only disfigures our skin but also cause many other diseases such as skin cancer and kidney problem. Experts consider our skin a third kidney because we excrete toxins through the pores just as we do through our kidney. Recently a test performed by the Prince of Wales Hospital in Hong Kong proved that Fairness creams contain mercury. It erodes the upper layer of your skin while lemon will not do so and also lightens the complexion. Even the Ayurvedic and herbal fairness creams also contain some of the above mentioned chemicals. 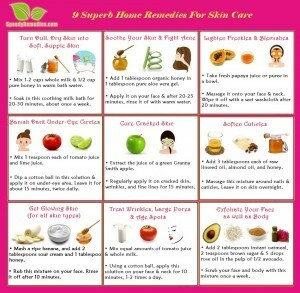 Only the home remedies for skin care are free of chemicals. To make the following home pack is not rocket science. These skin care home remedies comprising face packs are made up of fresh ingredients and are devoid of artificial chemicals that hamper your skin. Use of Turmeric to fight pigmentation: Mix little amount of turmeric with cucumber juice or lemon. Apply this to the pigmented area of your skin. Leave it for ten to fifteen minutes and wash off. Do this for few days and gradually normal color of your skin will return. Lemon is a great astringent. Turmeric is an antiseptic and anti-oxidant that helps cure skin problems. Thus it is a good home remedy for skin care. Milk exfoliates and soothes your skin: Milk is very effective in bleaching your freckles and pigmented spots. You can use this paste. &frac14; glass of sour milk is mixed with oatmeal .Place it between two layers of cheesecloth and keep it on your face for sometimes. Anti Wrinkle treatment for perfect skin: Whisk the tomato juice with an equal amount of milk. Store this mixture in the refrigerator. Apply this pack routinely twice a day. Leave this on your face for 10 minutes. This works as one of the best natural home remedies for Skin Care. One can apply our traditional moisturizer malai to skin. It not only lightens complexion but also keep skin healthy. It is very effective for dull and dry skin. Ghee can also be used as a moisturizer. Both ghee and malai can be used as a night cream. The banana-honey face pack: Whisk together two tablespoons of honey, two teaspoons of glycerin, one egg white and one mashed banana to form a smooth consistency. Gently massage your face with this pack. The fingers should follow a circular movement while massaging your face. Then coat your face with the remaining mixture. Leave it for fifteen minutes and wash off your face with water. This home made face pack not only rejuvenates your skin but also give it a supple feel. The cream – avocado face pack: Whisk a mashed avocado with two tablespoons of cream and honey to a smooth consistency. Again use this therapeutic pack to massage your face with your fingers in circular motion. People with dry skin can immediately get a glowing look by applying this face pack. For cracked skin: Routinely apply juice of green pineapple to get rid of cracked skin. Keep it for 10 minutes and wash off. To keep your face neat and clean: Routine application of mixture of Rose water , Glycerin and lemon juice before going to bed adds shines to your face which stays longer. It keeps your face neat and clean from inside and serves as one of the most effective home remedies for Skin Care natural treatment. Reducing dark circles: Apply mixture of 1 teaspoon each of lime juice and tomato juice twice a day. Apply crushed mint leaves around the eyes. This provides cooling effect to the tired eyes and heals Dark Circles. How to make your own deodorant cream: Whisk together three tablespoon each of baking soda, petroleum jelly and cornstarch. Melt this mixture in a pan. Add some scented oil like lemon juice or crushed mint leaves. Apply this to get underarm protection. Best substitute of soap: Instead of using soap, wash your face with gram flour. Whisk gram flour and curd or milk. This renders fresh looks to your skin and helps. 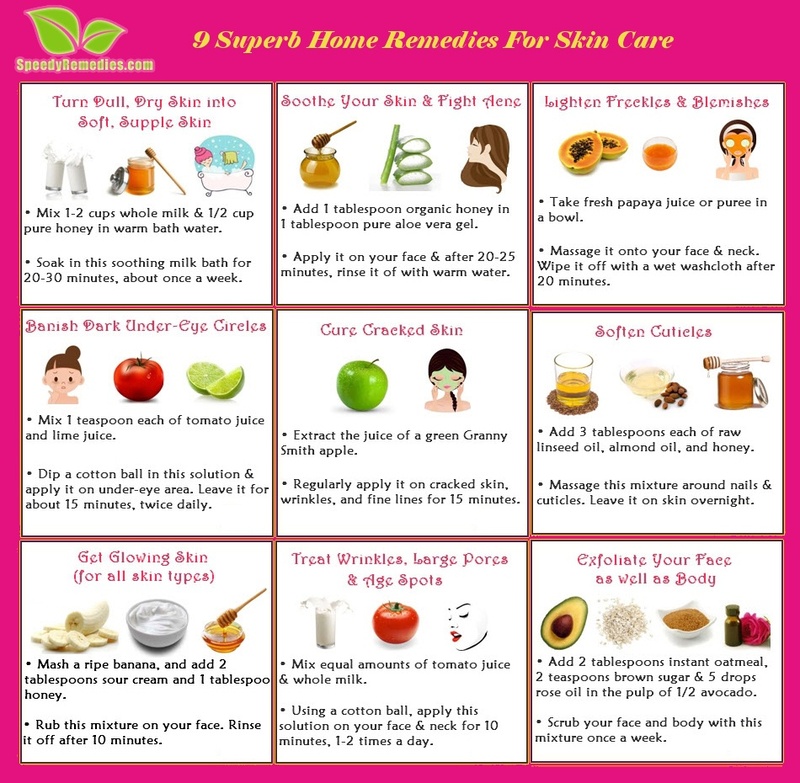 Some well known but often forgettable skin care natural remedies and tips for healthy skin. • Keep drinking water so that your skin can always hydrate. • Don’t wash your face too often, not more than thrice a day as it will leave your skin devoid of natural moisture. • Maintain a healthy diet. Make sure you eat fresh fruits and vegetables on daily basis. • Splashing some cold water on your face provides a natural glow to the skin which stays longer. • Get plenty of rest because some hormones and chemicals are produced only while sleeping. • Similarly bad hormones are produced when we are stressed out. So don’t get too stressed about work. If possible, practice relaxation therapy. So before emptying your wallet in those costly products, take a look in your kitchen, there are several home remedies for skin care. ur article gives me a lot of info i never thought this could be found around the corners of my home. mah skin is oily and i hav acne……..i want mah skin tone to lighten and i want to remove tha dark patches from mah face……and at da same tym i want 2 remove mah facial hairs..wat shud i use,…??? and is mixture of malai and lemon good 4 me?? ?